RNIB’s flagship publication, NB Online, is this month being recognised for reaching 100 years in circulation. Editor, Hannah Adams, looks back at what issues blind and partially sighted people faced in 1917 and how they compare to those experienced today. If you venture into the RNIB archive at the head office in London, you’ll see shelves and shelves of RNIB’s flagship magazine, The Beacon. Bound in beautiful green leather journals dating back to January 1917, its pages offer a social commentary of 100 years of eye health and sight loss information. As we wish The Beacon, now known as NB Online, happy anniversary, I wanted to find out what were some of the key issues for people with sight loss over the past 100 years and just why the publication is still going strong. When The Beacon’s first edition was published, Britain and France were fighting against Germany in WWI, revolution had broken out in Russia and in the USA, people were protesting on the streets of New York about the lynching of African American citizens. Uncertainty and unrest was high. 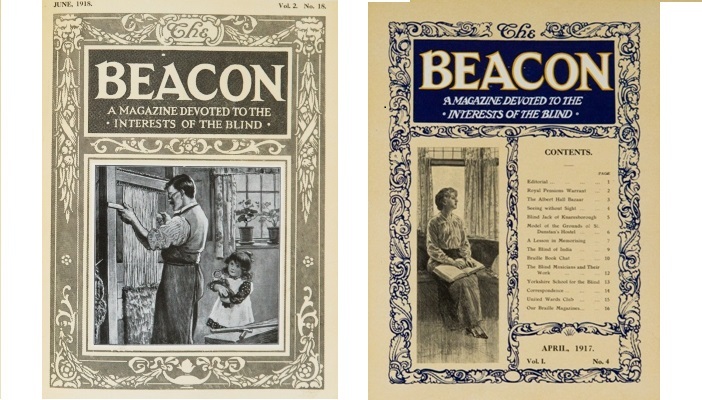 The Beacon began its life as a magazine dedicated to the interests of blind people. It was a monthly publication that included authoritative articles on all aspects of blind welfare throughout the world, documenting the causes and prevention of blindness, news items from home and overseas and included features, poems and letters written by blind authors. It was written for all people who had an interest in sight loss, and as such, the readership was broad. As a result, the publication included all kinds of features. It is only in more recent years that the publication began to focus solely on eye health and sight loss professionals as RNIB introduced new publications to suit the needs of specific audiences. Much of the content in the early years of the publication related to soldiers who returned from war having lost their sight. In the first edition in January 1917, the editor wrote, ‘We feel that with the publication of this, our first number of The Beacon, a new mile stone in the history of The National Institute (now known as RNIB) has been passed. At the time of going to press the storms-clouds that have covered the face of the world since the terrible days of the war in 1914 show little signs of lifting, so that it behoves us all to take a firm grip on our courage, and look before very long, when the dawn of peace will herald in the beginning of a new world and new conditions’. A common theme in the wartime period, and arguably throughout the magazine's lifetime, was about training and education. In order to not leave blind people ‘in the dark’, there was a real emphasis on making sure people with sight loss were fully integrated into society and that they were aware their contribution was valuable to society. Early reports of St Dunstan’s, a convalescent residential home for soldiers, offered training and what we would call today as rehabilitation, for the ‘brave blind’. The home taught carpentry, cobblery and market gardening. There was also the option for ‘men of superior mental attainments to take up massage, and, once fully trained, be sure of employment in military hospitals’. Throughout the magazines history, there are numerous features that highlighted blind and partially sighted people’s employment opportunities. Reports about different training opportunities, job adverts and updates about the number of blind people who belonged to different professions were printed. Did you know, in 1967, almost four in every 100 physiotherapists were blind? The magazine didn’t always include dense articles, but often, the tone and content was much lighter. In April’s edition in 1927, The Beacon published an article first printed in Outlook for the Blind, an American publication, about a blind lady’s unique occupation. Emma Mast, who had lost her sight at the age of 14, was employed in San Francisco as a coffee taster. The owner of the company believed that her sense of taste was keenly more developed on account of her lack of sight. It was reported she was employed for over 20 years and claimed to be the world’s only blind coffee taster. In a day’s work, she could sip different flavours and blends of coffee from South and Central America, Mexico, Hawaii, Java and Arabia. Similarly, in the first edition, The Beacon published a story about a fundraising opportunity for St Dunstan’s home. A Christmas market was held at the five-star hotel, The Savoy, in London, where thousands attended and proceeds went to help fund the home. ‘Stalls! Stalls! And yet more stalls! Everywhere the eye fell on articles to tempt the purse. It was a wonderland’. St Dunstan’s stall was flanked by lady vendors from Japan, France Belgium and Russia. The National Institute secured support from several of the many Unions including the Durham Miner’s Association, Textiles Trader’s Federation and National Union of Railwaymen & Co. who all agreed to pay the standard price of 2s 6d per worker, per year as an insurance for financial support should there be an incident. It was remarked to be a ‘step in the right direction’. The 1000th issue of The Beacon, now renamed New Beacon, was published in 2001. Former Editor, Ann Lee, wrote an article about the high risk of accidental overdoses affecting people with sight loss due to the inaccessibility of reading medicine labelling and correspondence from medical providers. ‘Even eye clinics are failing to provide their patients with accessible information’, Lee wrote. Research carried out by The National Institute had found that a total of 86 per cent of eye clinic patients received their appointment letters in standard size print, which they could not read. ‘Only 17 per cent of patients were given information about their treatment in their preferred format’. Fast forward 15 years, and the step-change that RNIB and many others had been campaigning for came into fruition with the Accessible Information Act in 2016. The law outlines that all providers must supply patients with correspondence in their preferred reading format. This is certainly a win for blind and partially sighted people and the sector, but it is unlikely the law is currently being enforced throughout the UK yet. Ever passionate about keeping blind and partially sighted people up to date with the Britain’s political stance towards disability rights, the April edition of New Beacon in 1997 was a general election special edition. The magazine requested comments from the six major parties about what they would do for blind and partially sighted people if they were voted into power. The Labour Party spoke of ‘skills, knowledge and opportunities’ as their party’s agenda for all people. Inclusive learning in mainstream schools for children with vision impairment rather than in specialist learning settings was favoured; more accessible transport and buildings was recognised, and they were careful to distance themselves from the Conversative’s decision in 1995 to block support from the Access to Work Scheme for those who were already in employment. The Conservative Party looked back retrospectively at the work they had achieved; explaining how they understood disabled people had individual needs. They listed low taxes for visually impaired people was a key priority, a new Code of Practice on special education had been introduced to give guidance to schools, LEAs and others on how to identify and assess special needs, and the Department of Transport had introduced a number of initiatives to make colour contrasting, audio announcements and grab rails available on buses and trains. The Liberal Democrats’ key policy commitment was to replace the ‘weak’ Disability Discrimination Act with ‘comprehensive civil rights legislation for disabled people’. The new legislation would be ‘backed up and properly enforced’ by a Human Rights Commission. There would be free eye tests for all, improvements made to the ‘dismal’ rate of job opportunities available to working age people with sight loss, an increase to the amount of television available with subtitles, signing, audio description and polling stations would be made accessible to voters. Interestingly, the author explains that they are on call 24-hours a day, seven days a week and that their home is their office. In today’s publication, a recent diary in the life of a vision rehabilitation worker was published. Similarities can be drawn between the roles even when 50 years separate their work. And for those who love a new gadget, you may be surprised to learn the first liquid level indicator came onto the accessibility market in 1969. The Beacon helped to promote it alongside all sorts of accessible household items, including an all-singing-all-dancing sewing machine from Sweden. Similarly, one reader’s letter published in the 2001 special edition of New Beacon caught my eye. Mr David Jones wrote about his dislike for a leaftlet RNIB produced called, ‘Meeting blind people’. It is understandable to see David’s point of view. People with sight loss aren’t different from sighted people, however, in November of 2016, RNIB produced six guides, two of which were aimed to help the general public identify when someone has sight loss and how to be a good guide. There is also a guide to how to communicate with someone with sight loss, which was the most read of all of the guides by RNIB Facebook users. Without being able to locate the leaflet David was referring to, it’s hard to say whether it was offensive and indeed redundant. However, at RNIB, what we find is that the public are eager to speak to and help a person with sight loss but they often don’t know how best to go about it. Arguably, education is needed to dispel myths about disabilities and give people the encouragement they need to act. There were also accounts of the number of people with sight loss in other countries outside of the Commonwealth. Charitable organisations from around the world were documented and their practises relayed to readers from as far afield as New Zealand and Japan. There was a short story about an Italian man who saved a child from drowning after he jumped in a lake. Luigi was blinded in an industrial accident 10 years prior to the incident and while sighted watchers gave him instructions on where to swim, he was able to save the child’s life. Today, the majority of NB Online’s readers live in the UK, but there’s also people who catch up with news and updates from the USA, Australia and India. The types of features and articles may be more focused towards eye health and sight loss sector professionals, but indeed, there is a great deal of blind and partially sighted people, their parents/carers and retired people who read the publication. To answer my earlier question about why is it still so popular with readers, I can honestly say that I think it is because the purpose and integrity of the publication hasn’t ever changed: to be an essential read for people who have an interest in sight loss. Tracy Elliott, a Rehabilitation Officer for the Visual Impaired recently, commented: “NB Online helps to keep us in touch with technology developments, new research and political issues that affect people with sight loss.” Geoff Pickance, an Eye Clinic Liaison Officer, also said: “Being registered as blind in my 20s, New Beacon and other sources of information led me on the path I am on now. It’s so vital [...] literally a life-saver”. If you agree with Tracy and Geoff’s sentiments, please share this article within your networks and help keep NB Online the vibrant, important publication it has been throughout the last 100 years.